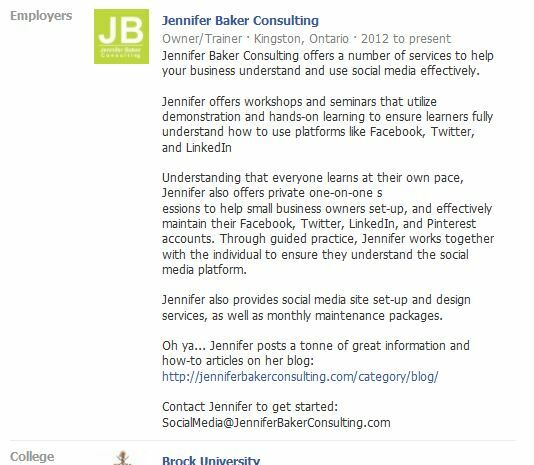 A few weeks ago I was contacted by an individual who understood the importance of social media and wanted to improve their LinkedIn professional profile for their impending job search. The individual, however, had set-up their account using their corporate email to which they no longer had access. After contacting their previous employer and resetting their LinkedIn password, my client finally had access to their account. While it caused a slight delay and headache, my client was fortunate the previous employer still had access to the old email address. My client could have lost complete access to their account – and there is nothing that LinkedIn could do to assist due to privacy. The account would been held in LinkedIn purgatory. Moral of the story: Have two email addresses connected to your LinkedIn account. Adding a second email address will ensure that you never lose access to your account. A good suggestion is to use a personal email address as well as a professional email address. 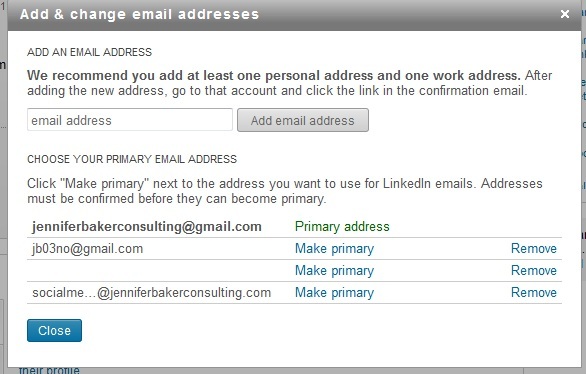 Adding two emails will ensure that you always have access to your LinkedIn professional profile. This morning I was providing training to the business manager of a local chiropractor. Through our conversation I learned that it was difficult for her to make time during her day to create and post updates during busy office hours. Ah ha! I have a solution! It involves creating a very basic 4-step social media strategy. What do you want your social media accomplish? Who is has ‘liked’ your page? Who is visiting your page? Why would the audience ‘like’ your page? What information do they want? Adjust the goals if they are not in-line with what the audience requires. Given what you want your social media to accomplish and your audience, what type of information are you going to share/create on your Facebook page? Understanding the client has little free-time to research and create updates I suggested scheduling updates during office slow-times. While Facebook’s high traffic time is Monday-Friday between 11:00am-3:00pm, scheduling posts during off-peak hours ensures the message does not get lost in the individual’s Facebook Newsfeed. To schedule a post, create the post then click the clock in the bottom-left corner. Choose the appropriate year, month, day, hour, and minute. Click schedule. Following these 4 steps will ensure that your social media stays on focused and effective! If you’re a sole proprietor looking for ways to promote your business, you will want to take advantage of this Facebook tip! While some individuals believe the only place to promote your business is through the professional networking site LinkedIn, there exists an opportunity to highlight it on your Facebook Personal Timeline. I understand that people are very protective and secretive about information on Facebook Personal Timeline, however, there is a time and place to share information – especially if it has to do with your small business. 4. 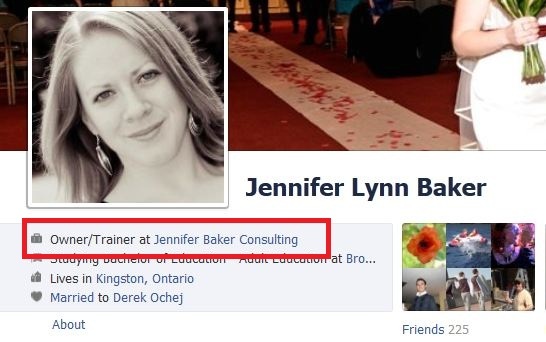 In the box “Where have your worked?” start typing your Facebook Page’s name. As you type, your page will populate as an option. Select it. 5. Complete the remaining fields including position, city, and a description. 7. Finally, make this information public by selecting the globe. Now whenever someone looks you up, they will have information to connect with you on your business’ Facebook business Page. When Facebook launched its platform in 2004, it was designed for personal use only. As you know, Facebook was the first social media platforms to gain a foothold in the marketplace. While the general population was excited to create a profile and connect with old friends, the annoyances began. Between updates from friends and pages, there was just too much going on! This blog post is dedicated to my professional organizer friend, Karyn Beacock, of Spiral Into Control. If you’re struggling with keeping on top of your friends’ updates, Page updates, and subscription updates consider creating Facebook Interest Lists. 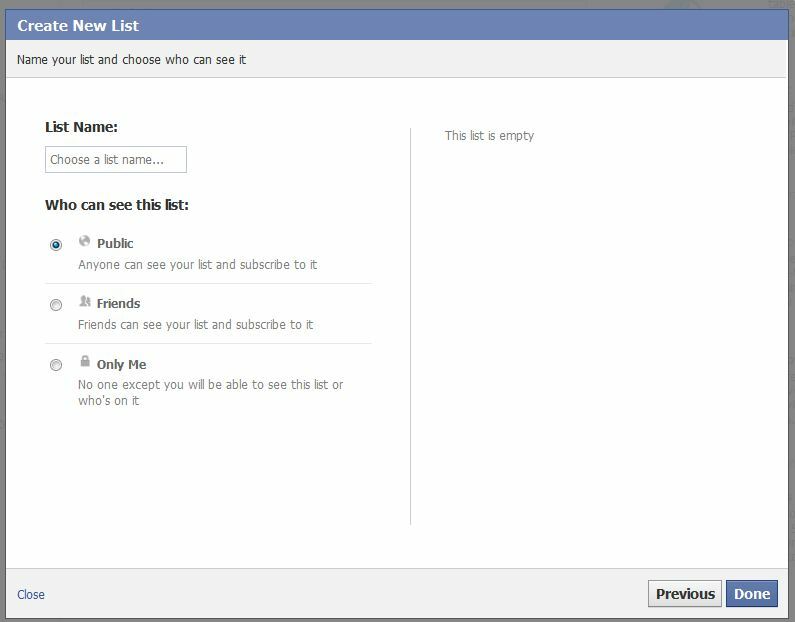 Facebook Interest Lists allow Facebook users to create a collection of friends, pages, and subscriptions. Clicking on the list will allow the user to receive all the updates from that list (e.g. 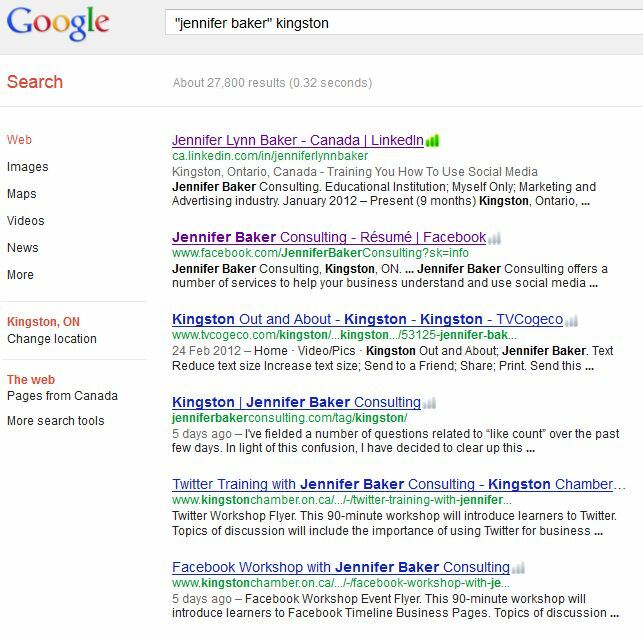 A professional list can include professional contacts, as well as business-related pages). 8. Move the Interest List to your Favourites, by hovering on the list in the left-column. Now you can receive updates from friends and pages when you want to receive them. Whether you like it or not you have an online identity and brand. This identity is comprised of what people say about you, and what you say about yourself. If you haven’t Googled yourself, try it now. What does it say about you? What websites appear? What social media accounts pop-up? Here are the results for me. I am a shy, introverted person (this may be a surprise for my seminar participants!) with a very private Facebook Personal Profile. I realized early on, however, the importance of maintaining my online identity. As a result, I made the active choice to control the information that was circulating about me and my business. LinkedIn allows you to input your Twitter account, website, phone number, and email. 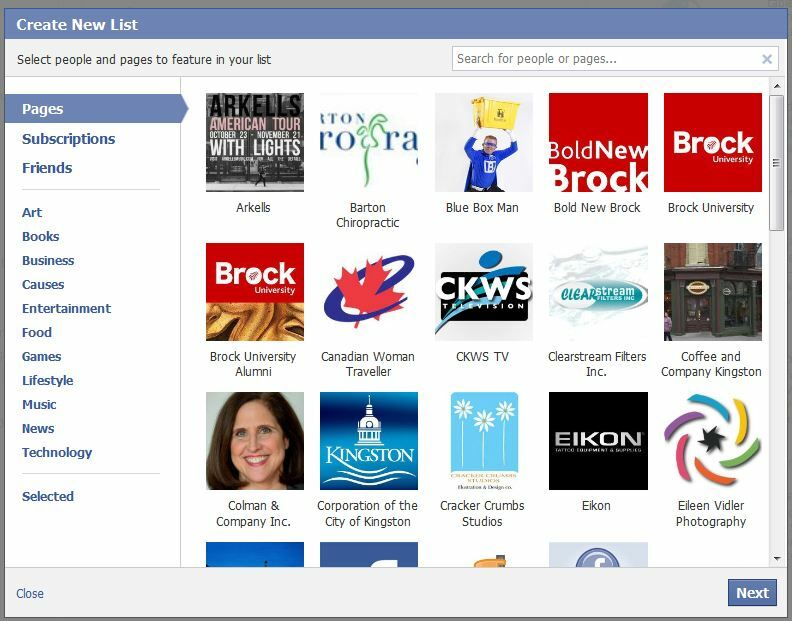 Facebook Pages allow you to input your phone number, email, location map, as well as applications to showcase your Twitter, Pinterest, YouTube, Google+, ETSY, and website. Twitter allows you to input your location information, and website. …. Are you seeing a pattern? When the option presents itself, make sure to provide links to all your social media accounts. Why take the risk that someone search for your Twitter account and a) not find it, b) find and follow the wrong one. Provide all your contact information at all customer touch points. While it may feel excessive, or repetitive – these are key characteristics to build great brands!